In 2018, Americans will pay $3.4 trillion in federal taxes and $1.8 trillion in state and local taxes, for a total bill of $5.2 trillion, or 30 percent of the nation’s income. Americans will collectively spend more on taxes in 2018 than they will on food, clothing, and housing combined. Tax Freedom Day, which is the date that represents how long Americans as a whole have to work in order to pay the nation’s tax burden, fell this year on April 19, 2018. What this means is we spent 109 days this year working to pay the government, at all levels. This entry was posted in Elections, John Palacio, School Bonds and tagged Bond Measures, John Palacio, Measure I, Property Taxes, Santa Ana, Tax Increases, Taxes on September 14, 2018 by ocprandemedia. It is bad enough that the SAUSD School Board, led by Trustees John Palacio and Valerie Amezcua, is trying to raise our taxes again – for the third time in Palacio’s tenure. But today the SAUSD sent a mailer to every resident in the district touting their latest tax raising scheme, Measure I. Imagine what this cost? This entry was posted in Elections, Measure I, School Bonds and tagged Bond Measures, Measure I, Property Taxes, Santa Ana, Tax Increases, Taxes on September 8, 2018 by ocprandemedia. 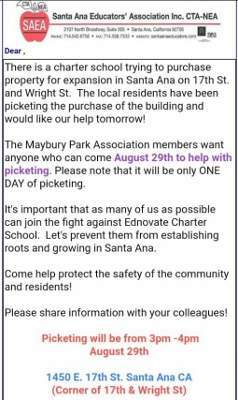 Neighbors of the Legacy College Prep charter school in Santa Ana have a beef about traffic and have been picketing at the school, as reported by the New Santa Ana blog. This school is part of the Ednovate program sponsored by USC. This entry was posted in Elections, School Choice, Unions and tagged Barbara Pearson, Ednovate, Education, Legacy College Prep, Maybury Park Neighborhood, planning, Sal Tinajero, Santa Ana, santa ana educator’s association, traffic, Vince Sarmiento on August 30, 2018 by ocprandemedia. Is it time for ward-specific SAUSD School Board elections? The City of Santa Ana has placed a charter amendment on the November 6, 2018 General Municipal Election in order to comply with a lawsuit asserting that the City’s current at-large electoral system, whereby council members are elected by all of the city electors, violates the California Voting Rights Act because it allegedly does not allow Asians (a protected class) to elect candidates of their choice or otherwise influence the outcome of Santa Ana’s council elections. This entry was posted in Elections and tagged Asians, California Voting Rights Act, Elections, SAUSD, Ward Specific Elections on August 27, 2018 by ocprandemedia.